Just north of the border of Colorado near US-85, about equidistant between the outskirts of Cheyenne and the state line is Speer, Wyoming. Like most railroad places, it's just a spot on the map, a waypoint between here and there. In this case Speer is the junction where the north-south route of the old Denver Pacific connects with the main east-west Union Pacific Overland Route over Sherman Hill. 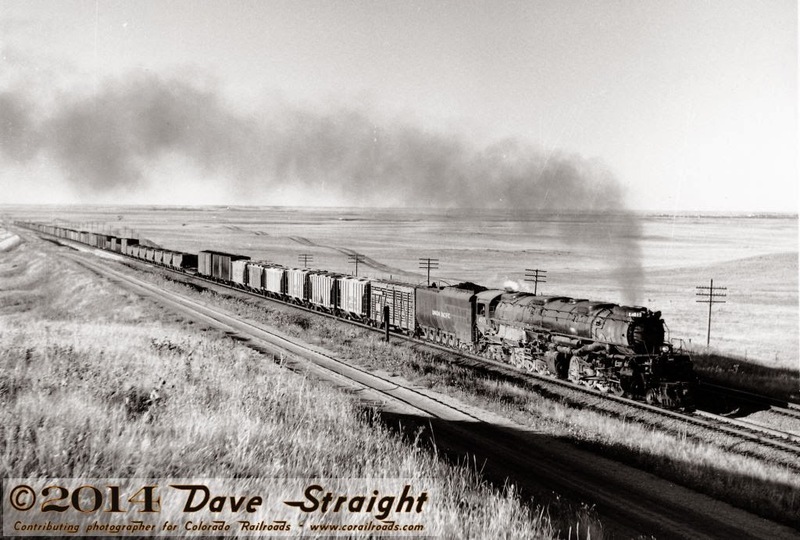 This past week, 56 years ago, a Union Pacific Big Boy rolled westbound from Speer toward Sherman Hill with its manifest freight, and Dave Straight was there to photograph it. Another September would never come for most of the Big Boys to haul freight. Just 10 months and 2 weeks to the day after this photo was taken, the same 4015 would make the last revenue run for any Big Boy over these same rails before being retired and eventually scrapped. Only 8 Big Boys were spared, including 4005 sitting at Forney in Denver and the celebrated 4014 undergoing restoration (as this is written) in Cheyenne, just a cinder's glide from where this was taken.